One of the largest crowds ever participated in-person and on-line in the Town Creek Farm Sale, at the ranch near West Point, Mississippi on Saturday, October 21, 2017. When auctioneer Doak Lambert of Decatur, Texas, laid the gavel down following the final bid, 81 buyers from 13 states were successful buyers of Town Creek Farm TruBrangus™, Brangus and Ultrablack genetics. Guests from both Paraguay and Uruguay, South America, were on hand to evaluate the Town Creek Farm genetic program as well. The Town Creek Farm sale offering provided valuable opportunities for registered and commercial cow-calf producers to make rapid genetic improvements in their cattle operations. “This is the best set of Brangus bulls offered at sale that I’ve seen in a long time,” said a veteran Arkansas commercial cowman. The same words were spoken of the powerful commercial bred heifer offering. 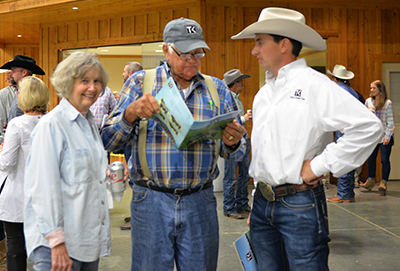 Sale attendees were particularly swayed by the depth of quality in both the bull and heifer offerings. In his opening comments, Town Creek Farm owner, Milton Sundbeck, spoke of the future genetic direction of Town Creek Farm. Sundbeck summarized the Town Creek Farm TruBrangus™ new genetics project currently running at full throttle, which began with Brahman and Angus base genetics. He also expressed his belief in the value of 5/8 Angus and 3/8 Brahman TruBrangus™ and emphasized Town Creek Farm’s continued focus on developing genetics while staying true to fertility, longevity, soundness and heat tolerance. The high selling bull was Lot 21, a TCF Rapid Reward 145Z3 son, out of a CCR Integrity 355S4 daughter. The powerful and massive bull was among the highest indexing bulls for carcass traits in the sale. He posted a 146% yearling marbling ratio. The phenotype of Lot 21 caught everyone’s attention including winning bidder, Wells Cattle Company of Ridgeland, Mississippi, at $16,000. The second high selling bull was Lot 25, TCF Sleep Easy 145C6, a two-year old bull intended for use on heifers. The User-Friendly bull posted big ultrasound and performance numbers then coupled them with a rare companion of calving ease. He sold to Dollar Farms of Bainbridge, Georgia, for $13,000. Dollar Farms also took home the third high selling bull, yet another bull recommended for use on heifers, Lot 40, TCF Sleep Easy 024C4. This bull posted solid numbers and was described as a bull with pounds in the right package. He sold for $11,500. Two half-blood bulls, full brothers, were the forth and fifth high selling bulls. Sired by the AAR Ten X 7008 SA and out of a renowned Kempfer Cattle Company Brahman female, these invitro fertilization mates posted big ultrasound numbers, tremendous performance and offered buyers an opportunity of true hybrid vigor. The bidding was hot and fast. Drawdy Brothers of Florida outlasted the competition to own Lot 62 for $10,750 and Williamson Cattle Co. also of Florida had the winning bid on Lot 61 for $10,000. The volume bull purchaser was repeat volume bull buyer Triple S Ranch of Florida. The commercial bred heifer portion of the sale showed tremendous demand and strength from start to finish. Genetically sourced heifers from Town Creek Farm and Cow Creek Ranch bred back to the same genetics were the highest quality heifers from top to bottom ever offered at the ranch. Town Creek Farm offers its customer base an opportunity to market Town Creek Farm sired heifers during its annual bull sale. The sale is a continuation of the previously held 18-year running Cow Creek Ranch Commercial Bred Heifer Sale. When all was sold and done, 266 heifers sold for an average of $2141 per head. The customer-owned heifers were offered by Williamson Cattle Co. of Florida and Alabama, a 20-year consignor sale consignor; River Oaks Farm, Arkansas, 19-year consignor; 18-year consignor, CP Bar Brangus, Mississippi; 13-year consignor, Megehee Cattle Company, also of Mississippi; along with nine-year consignor, Montgomery Farms, Alabama; five-year consignor, B&B Farm, Alabama; three-year consignor Longino Ranch of Florida; two-year participant, Lowell Dollar Farms of Georgia; and Walker Land and Cattle of Alabama. 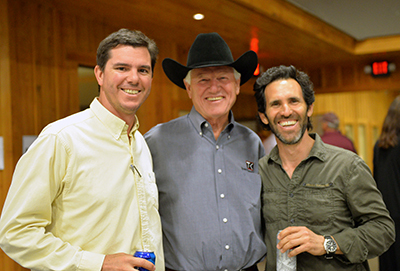 Town Creek Farm owner, Milton Sundbeck (center). Town Creek Farm prior to the bull sale.